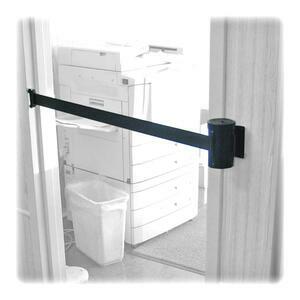 Adjusta-Tape Wall Mount Kit houses black webbed tape that extends up to 15' and retracts slowly and safely when needed. Metal plate is attached to wall mount and screws into wall. Kit also features a black, plastic wall receiver that screws into opposite wall and catches tape from wall mount unit. Kit includes all screws needed for mounting.